This seven-inch single, Hot & Informed (Apr. 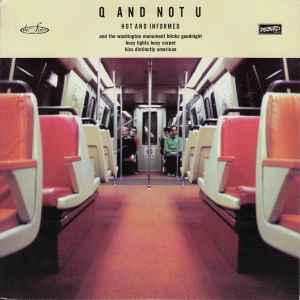 2000) was the debut of Q And Not U, and a prelude for their first album, No Kill No Beep Beep (Oct. 2000) released a few months later. Two of the songs here, Washington Monument and Kiss Distinctly are early recordings and are found rerecorded on the proper album. However, both versions of these songs involved all of the same personnel and were done at Inner Ear in DC. Of particular note, this iteration of Kiss Distinctly sounds better in my opinion, especially the over-blown tuning of the guitar towards the end, it lends a fantastically maddening aspect to the overall build of this great song when compared to the LP version's more reigned-in and controlled nature. Busy Lights Busy Carpet is the only non-album song and here is the only place it can be found in their discography. Its a syncopated, quick and propulsive tune that is punctuated by the insistent double-note of the guitars. Shawn Brackbill provides the sleeve photography of the band on the DC Metro and he would stick with the group providing pretty much all of the photograph artwork throughout their discography.